In 2008 the price of aluminium plummeted from over $3,000 per tonne to below $1,500 per tonne, causing the stock price of Alcoa – one of the largest aluminium producers in the world to head in the same the direction. The outlook was grim. But fortunately for Alcoa, the firm had just signed up a CEO who had the skills and talent to steer the aluminium producer through one of the more difficult periods in it history. Born in Bremen in Germany, Kleinfeld began his career as a marketing consultant in 1982 but before long had joined Siemens, the global engineering and technology services firm, and one of Germany’s greatest companies. Kleinfeld started out as an advertising and design manager in 1987, but swiftly rose through the ranks, and was appointed CEO of Siemens Corp in the US in 2002, and then returned to Germany as head of strategy, where he was promoted to the Siemens AG CEO spot in 2005. Along the way he acquired a PhD in strategic management from the University of Wuerzburg, and an MBA from the University of Goettingen. He arrived at the helm of Siemens during a tough time for the organisation, but as CEO, Kleinfeld tried to bring to Siemens AG some of his experience from running the business in the US, some of the American can do entrepreneurial attitude. He introduced new labour terms extending working hours, sold off some poor performing units on the handheld set side, merged the computer-services units and software divisions, and engineered a tie up with Nokia. Despite some fierce criticism of his approach, his rewiring of the German firm boosted sales, profits and market capitalisation. 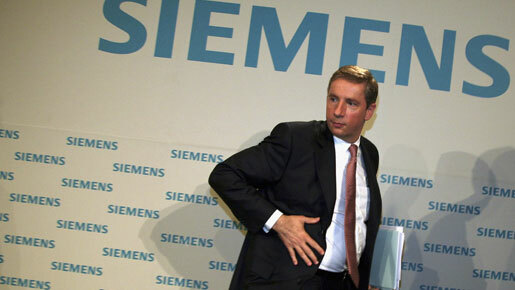 Unfortunately for Kleinfeld, his time at Siemens came to an unsatisfactory conclusion when the company was engulfed in a well publicised bribery scandal. Kleinfeld wasn’t implicated, but nevertheless resigned following the firm’s Chairman, Heinrich von Pierer, out of the door. It wasn’t long, though, before Kleinfeld was back in the corporate fray, when he joined Alcoa in the summer of 2007. Incorporated in 1888, as the not so catchy Pittsburgh Reduction Company, Alcoa (from the Aluminum Company of America) is one of the world’s leading producers of primary and fabricated aluminum and alumina. The company, founded by Charles Martin Hall, who invented a process to extract aluminium from its bauxite ore, swiftly progressed from smelting, to selling aluminium kettles, to the extraction and manufacture of raw materials, and even power generation. Today the firm employs 59,000 employees in 31 countries, and its products make up over 90 percent of the aluminium alloys used in aircraft, and millions of aluminum drinks cans, as well as alloy wheels and various building products.Kleinfeld was not to know it but he joined the firm just as it headed into one of the most turbulent periods in its 120 year plus history. In the twelve months from mid 2008 aluminium prices tumbled some 60 percent. Unsurprisingly, Alcoa’s stock price took a big hit. The stock, which momentarily hit a peak of $47 in July 2007, slumped to below $5.50 in 2009, before climbing back towards $15 as 2010 drew to a close. One issue for Kleinfeld is delivering growth continued growth amidst considerable economic uncertainty. Yet, encouragingly, Alcoa raised its expectations for global aluminium demand in 2010 to 13 percent. And while stock watchers often focus on China, as Kleinfeld has pointed out in the past, it is a global market and there is increased demand from places such as India and countries in South East Asia. In fact Kleinfeld is optimistic about global demand. “In countries such as China, Brazil, India and Russia, more and more people are moving into the middle class, driving demand, in building and construction, transportation, and packaging,” the CEO said in a Q3 earnings statement. And in China, where one nation’s economic growth is driving corporate growth across the world, Kleinfeld talks about demand for aluminium up some 21%. Not that markets closer to home should be ignored, he notes, with both the aerospace and auto sectors in the US showing strong growth. Another important issue for Kleinfeld is sustainability. The firm has won a bunch of awards for its CSR performance, but making real progress on social and environmental responsibility is not always easy for a metals and mining firm. Kleinfeld’s comment in an interview for special World Economic Forum edition of the magazine Swiss Style, makes it clear that he is committed to making a difference by continuing improving the firms’ performance on sustainable business practices. “Sustainability is in our DNA and has been guiding us since before the word even existed,” he says. As Kleinfeld notes, the firm has cut back greenhouse gas emissions by 36 percent since the 1990s. And the properties of aluminium are useful when it comes to sustainable performance, as the company’s website points out “approximately 75 percent of all of the aluminum ever produced since 1888 is still in active use today.” A good example of Alcoa’s and Kleinfeld’s intentions on sustainability, for example, is the introduction of an iPhone app in late 2010 to help consumers find recycling centres and keep track of the money they earn back through recycling aluminium products. And Kleinfeld doesn’t just want to deliver good results. Although with year-on-year sales up five percent in the third quarter of 2010, and the company’s smelters on their way to producing 3.6 million metric tons of aluminium in 2010 – an 80 percent capacity utilisation rate, up from 75 percent in the second quarter – he certainly seems to be doing that. But Kleinfeld also has a distinct take on the kind of leadership required to be successful in the global economy. He made his views on the subject clear during a speech to business school students at Wharton Business School in 2006. Leaders in global business world should be challenging themselves to improve their performance, be willing to delegate and not over controlling. They should be entrepreneurial, but responsibly so. “If you dig a hole in the ship below the water line, you risk the entire ship sinking. That kind of entrepreneurial behaviour is not a good idea,” he noted. In addition, you should respect your colleagues and engage in dialogue with others, and while maintaining a degree of independence not sacrifice team spirit as a result. “Nobody’s perfect, but a team can be,” he says. Now that sounds like the kind of leader you would want in charge of your company. Alcoa, it seems, is in safe hands.